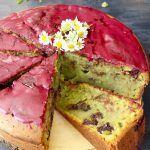 Fluffy like a pillow and draped in a luscious blueberry glaze, this avocado cake recipe is made with creamy ricotta cheese, decadent dark chocolate chunks and smooth olive oil. Can you resist? I have a confession to make: fragrant Olive Oil + Ricotta Cheese make my world go around, for reals! 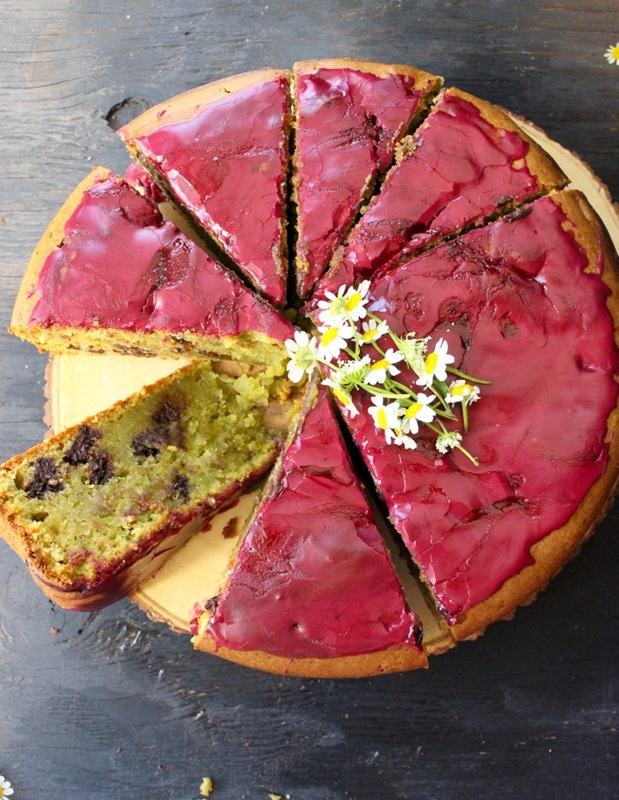 Because one more olive oil cake recipe, drizzled with blueberry glaze, makes the world a better place you know..? Well, at least for the time we spend eating it anyways! 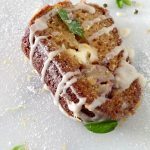 A riff on my old Ricotta Olive Oil Banana Bread Bundt Cake, only with a more cake like texture and new flavors. It is fluffy and creamy and decadent, a perfect blend of smooth extra virgin olive oil, creamy ricotta cheese and some avocado for color. To that, you add a handful of roughly chopped dark chocolate, not too much, just enough to give us a few chocolaty pockets at every other bite. And then, just so that I feel good abut calling it a cake, I made a luscious blueberry glaze to rustically pour over the top. Because you know me: Pink and Green Forever ! 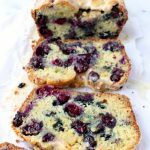 Seriously tough, last week’s Lemon Olive Oil Cake was a dream, but this rustic blueberry glaze olive oil cake recipe is a gift from the Heavens above! Can we even handle this beautiful mess kids ? Easy. Decadent. Exquisite. Chocolate. Avocado. Luscious Blueberry Glaze. 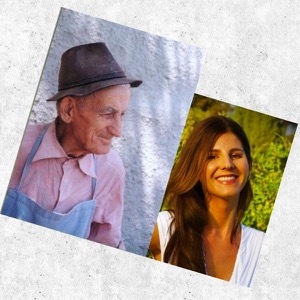 Rustic Beauty. You cream the eggs and sugars together until fluffy! 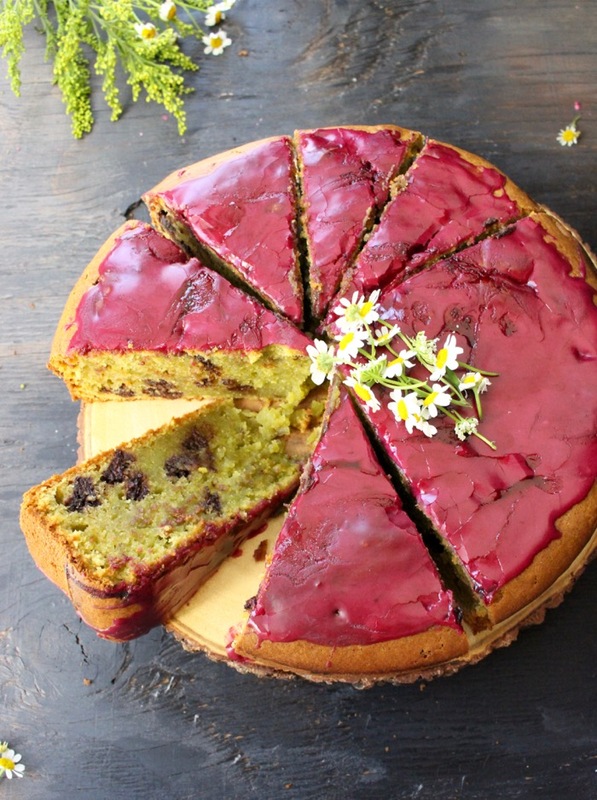 One by one you mix in the remaining ingredients and then bake your olive oil cake! 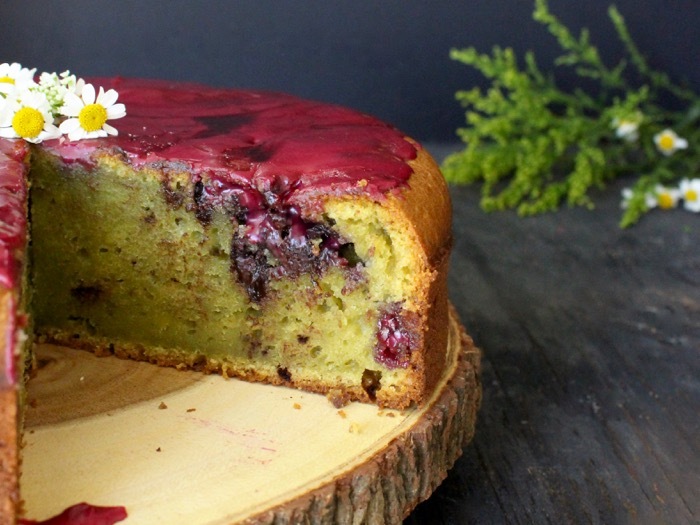 While the cake is cooling off you make that luscious blueberry glaze! Is that easy or what? Because you should know by now that I don’t do complicated! If yours truly can do it, so can you! Chocolate and avocados are something special, but I know some people who just hate chocolate. I won’t name any names right now because I’m not like that, but for those of you I would say: just skip the chocolate altogether or replace it with fresh blueberries. Because you know we have that blueberry glaze to tie them all in together. There you have it, a sneak peek into my brain on a daily basis. Sometimes I write recipe notes to self, notes that I can’t even figure out what my vision with that recipe idea was… The struggle is real you guys! But Me is all i got, and I’m sticking with her! There are many more crazy cakes where this came from, the only question is: can you handle it? And have you made these Italian wedding cookies yet? Note worthy: tough baking is supposed to be kind of an exact science, that is not the case with this olive oil cake. For instance, when making the blueberry glaze, at times I need more powder sugar. It depends on how thick my blueberry sauce ends up being. So best thing to do when making the glaze, is to whisk together some of the blueberry sauce into the powder sugar little by little. Once the glaze has a nice, smooth, thick consistency that coats the back of a spoon, you should be good to go. check the cake at 45 minutes and make sure the tooth pick inserted in the center comes out almost clean, not dry, you want it a little bit gooey. make sure the cake has cooled off completely before pouring the blueberry glaze over the top, otherwise the sugar in the glaze will melt and separate from the blueberry sauce, not a good thing. allow the glaze to set on top of the cake before cutting into it! I know this is tough, but you gotta do it! 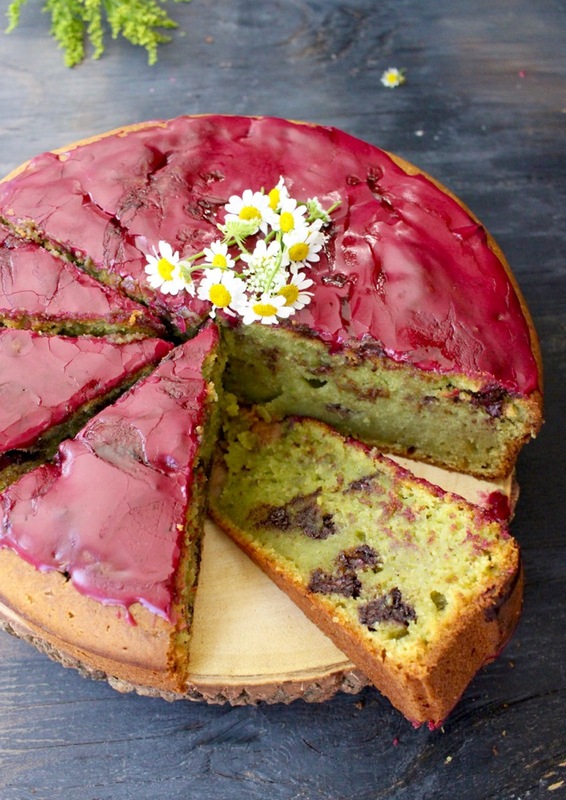 Fluffy like a pillow and draped in a luscious blueberry glaze, this avocado cake recipe is made with creamy ricotta cheese, decadent dark chocolate chunks and smooth olive oil. Prepare a 10 inch sprig form pan lightly greased with a dab of butter. Place on a cookie sheet and set aside. Preheat your oven to 350”F. Using the whisk attachment beat together the eggs, vanilla extract and granulated sugar until creamy and fluffy. Start pouring in the olive oil while continuously whisking. Add the ricotta cheese and avocado and whisk until incorporated. Add the salt, baking powder and baking soda and sprinkle in the flour. Continue whisking just until incorporated. Add the roughly chopped chocolate to the cake batter and using a spatula fold them in. Pour the olive oil cake batter into the prepared spring form pan an bake in the preheated oven for 45 minutes to 1 hour, until a toothpick inserted in the middle comes out almost clean. Transfer the cake to a cooling rack and allow it to cool off completely before removing it from the pan. Meanwhile make the blueberry glaze. Add the blueberries and lime juice to a small sauce pan. Bring it to a simmer on medium flame and cook for a few minutes until the blueberry shave burst and released their juice. Allow it to cool. Strain the blueberry sauce into a bowl to separate the liquid from the solids. Using a small whisk start mixing together some of the blueberry sauce with the powder sugar until a thick smooth glaze forms. 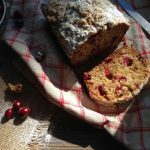 Once the olive oil cake has cooled off completely, remove it from the pan and carefully place it on a cake stand or plate. 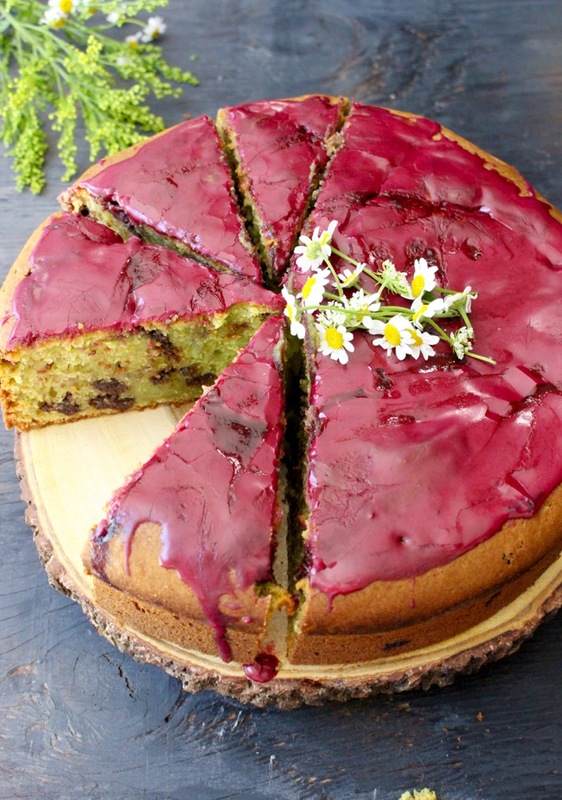 Pour the blueberry glaze over the top and allow it to set before cutting into the cake. Garnish with flowers or extra chocolate chunks if desired. If the top of your olive oil cake puffs up during baking, not to worry. As soon as it cools off the top will naturally deflate and look normal again. 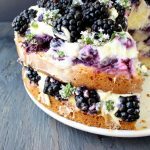 I love how easy this cake is and you totally had me with the blueberry glaze – YUM! Thanks Jenn, I had me with the blueberry glaze too, because so pink and girly! hope you try it soon! Give me a slice of this! What incredible flavors in this cake. You can have two slices and extra blueberry glaze! Thanks Amanda, you know it’s all about that glaze girl! Looks like a great dessert! Looks so moist! 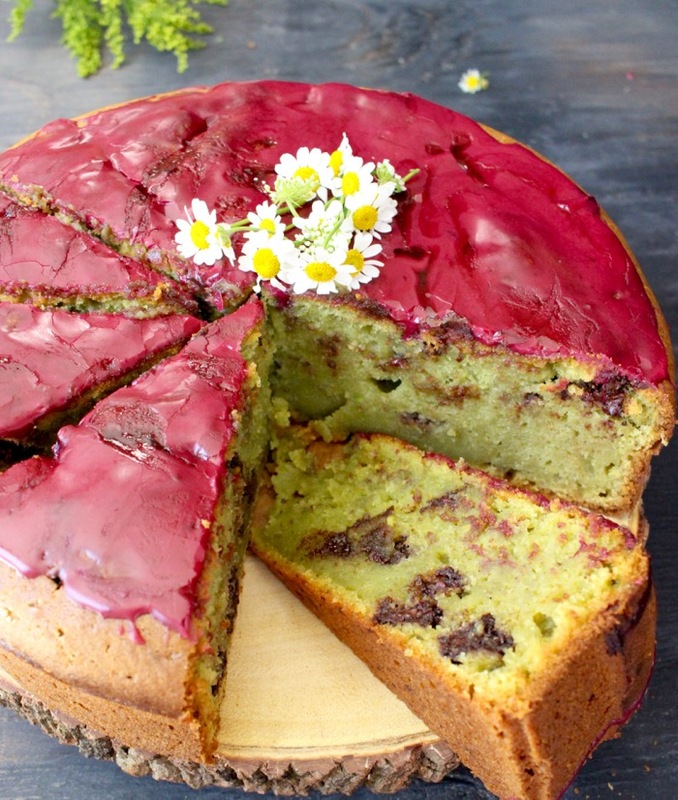 I love using olive oil in my baked goods and this cake looks like perfection! I love that pretty colored glaze on top….yum!